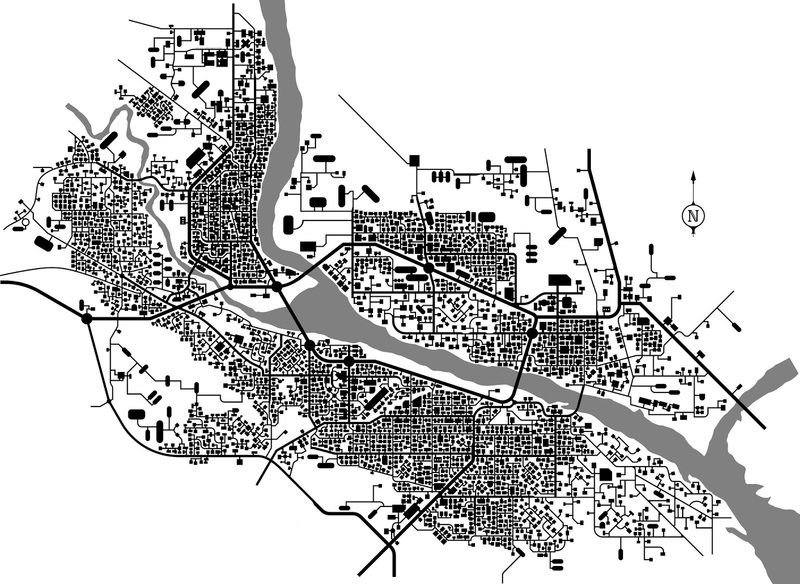 This is a map of the Tri-Cities (Kennewick, Pasco, Richland, West Richland, Finley) imagined as an underground complex. Largely inspired by the video game Dwarf Fortress and some of Daniel Reeve's maps. The black parts are walkable floorspace (tunnels, bridges, vaults, etc.) and the rivers, in gray, are subterranean chasms thousands of feet deep. The chasms, rooms, and corridors were drawn in a vector graphics editor (Inkscape) with satellite imagery overlay for reference. Some rules are observed: To preserve structural integrity, walls have to be at least five feet thick. (From this, the size of the fort shown can be figured as roughly 3,550 ft. east-to-west and 2,575 ft. north-to-south, or about 2⁄3 mi. by 1⁄2 mi.) To avoid lithic fractures, corners/outcrops can't be more acute than ninety de- grees. Farms have rounded corners or are shaped like capsules to maximize volume and minimize cost of excavation. Although it remains unbuilt as of this writing, I've included the Duportail Bridge in Richland. Licensed under Creative Commons Attribution-NonCommercial- ShareAlike (BY-NC-SA) 4.0. Prints should be available in 2-3 weeks.